Whatever you may have read anywhere JAWA and CZ motorcycle engines do not require any form of gasket sealant on the cylinder head gaskets. If your head gasket is leaking you will see signs of oil/petrol weeping from the joint. Sometimes you can simply tighten down the head but it is usually better to remove the head and fit a new gasket. Always examine the old gasket to see if it shows signs of “blowing”. This could be a burnt area, a damaged gasket or just a dark streak of oiliness. For road bikes there have been two types of gasket. Older bikes had a fibre asbestos type gasket and later models have aluminium gaskets. Neither gasket type is reusable. Twin cylinder models have one gasket per cylinder and use the same type gasket. The availability of asbestos gaskets is virtually nil but it is safe to use the later aluminium gaskets as replacements. 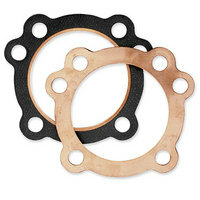 These gaskets form a seal by being crushed between the head and the cylinder. A common problem is that riders say there is no gasket fitted. They are normally wrong having failed to see the crushed gasket in the head. It is essential that all old gaskets are removed before new gaskets are used. Even if you dig out one gasket just check there is no old gasket beneath it. It is always worth checking that both the cylinder head and the barrel top is flat and this can be done simply by using a steel rule across the surfaces or if you have a thick sheet of glass you can use that with great care. Engineers use a flat steel plate to check trueness but the home mechanic is seldom so lucky. If the barrel or head is only slightly warped you may be able to true it up (make flat) by placing a sheet of emery paper on the glass surface and rubbing the head in a circular motion on the emery on top of the glass (to ensure it is flat). Major distortion requires either a new head or the old head to be skimmed by a competent engineer. Generally it is the head and not the barrel that distorts. JAWA CZ recommend the use of a smear of grease simply to hold the new gasket in place in the groove of the head prior to fitting. Older models have 3 cylinder head nuts – one reason for head distortion - as it is easy to tighten down the head unevenly. JAWA CZ recommend that the piston is at top dead centre when you fit the head. Fit the head (with gasket in place) then tighten the head nuts evenly and gently making sure the pressure remain equal by tightening opposites. Final tightening really requires a Torque wrench to achieve the required pressure. This is often 22 foot pounds (or metric equivalent 2.8 Kg's) but you should check the workshop manual for your model for the actual specification and the settings on your torque wrench. Again work round the nuts and try to tighten opposites rather than doing one side and then the other. Once tightened the heads do not usually require further attention but you may wish to recheck the torque settings once the engine has run for a short time. If you have no torque wrench you are guessing so spend about £10.00 and do the job right. Problems arise when under tightening the nuts as the gasket will blow.